In a previous post I concluded that natural circulation of air was an attractive method of removing heat produced by a population living within an artifical gravity tube within a gravity balloon. This notion was still very vague, so I want to place some numbers on that, and also potentially define the scale at which it would be economical. To summarize the idea, the airflow goes in at one end and out the other with no pumping. This is made possible by the fact that heat is produced by the inhabitants in their everyday lives, and also by the designed geometry of the cylinder which lets the hot air rise up to the outlet while preventing cold air coming from the inlet from reaching the center. Forms loss (I'll sometimes call k-loss) is a means of grouping together various resistances to flow along a flow path. This is always referenced to a specific cross-section on the path, and I will reference it to the pinched open end. For a free jet condition, it is somewhere around 1.0 generally. In our case, we have a large stagnant atmosphere outside of the tube as well as a mostly stagnant atmosphere inside the tube. That causes both the inlet and outlet to be something close to free jet conditions... with a lot of qualifiers. Since the flow is expanding radially, it must also exchange a great deal of angular momentum with structures attached to the rotating tube, similar to the case of a centrifugal pump. This should substantially affect the k-loss value, but probably not by more than, say, a factor of 2. Given that we have 2 free jet conditions, I would most likely expect k to fall somewhere in the neighborhood of 2 to 4, but this is a highly imprecise science at this point. Thankfully, as long as it's somewhere close to that range it shouldn't critically wound our overall conclusions. Tube radius, heat production, temperature range, end opening size, and air flow velocity are all important things which have very practical relevance to the design of an artificial gravity tube. Armed with some educated guesses for the k-loss factor, we can set constraints on these parameters. Firstly, I'll divide up these values which are absolute, fungible, and independent variables. By definition, the k-loss equation is the following. This quantity represents the frictional pressure head fighting against the direction of flow. The essential idea of natural circulation is that heavy cold air flows down from the inlet to the surface habitat, and then less-dense warmed air rises from the habitat toward the center-line point. To find the change in density we must return to basic PV=nRT gas law concepts. Compared to the magnitude of the temperature change, the pressure changes very little relative to its environment value. Thus, to deal with the density change we can just imagine that it changes linearly with the temperature change. It is this density change which gives rise to the natural circulation driving force. This works by the analog of (Delta_P=rho g h) in constant Earth gravity. But gravity varies with radius in the case of artificial gravity. Since the driving force is the difference in hydrostatic pressure change with altitude, it goes with the change in density as opposed to absolute density. Driving force then exactly matches the frictional losses experienced over the flow path. Thus, we can set the two expressions to be equal. This constitutes the momentum balance for the natural circulation heat removal system. With this relationship nailed down, we can consider the limitation on heat production. Along with this we have a litany other other supplementary relationships introduced. The mass flow rate through the tube is connected to the end window size. The area of the end window is related to the window's aspect ratio as well as the overall radius. Total heat production goes with total population as well as the per-capita energy intensity of the society (I call gamma). So while we added another equation, we also added another free variable. In other words, this doesn't add any dimensionality to the problem, it's just an auxiliary equation that I'll use to calculate a population limitation given the other parameters. With more-or-less 3 variables and 1 equation, we have two degrees of freedom. The relationship is pretty straightforward but it's not very helpful in that form without comparing it to some reference designs or tangible speeds and sizes. 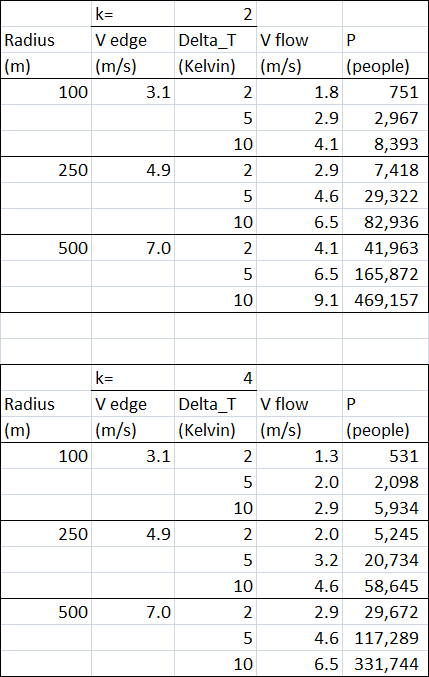 As a simple applcation of the equations, here are some values for 3 cases of radius, 3 cases of temperature, and 2 scenarios for the k-loss value. That is 3x3x2=18 total numbers. In each of those cases, we have dependent variables of "v" (the velocity at the end windows) and "P", the population. For some further notes, I've included the velocity of the edge of the window for all the cases for different radii. These are assuming that the windows are 10% of the radius of the habitat surface. I've distinguished between that as "V edge" and the flow relevant to heat removal as "V flow". As you can see, the window edge velocities tend to be even higher than the outward and inward flow for the other parameters I've selected. That, itself, might be a problem but it's a geometric consequence of the window size. The window could be made smaller while accepting some other sacrifices. 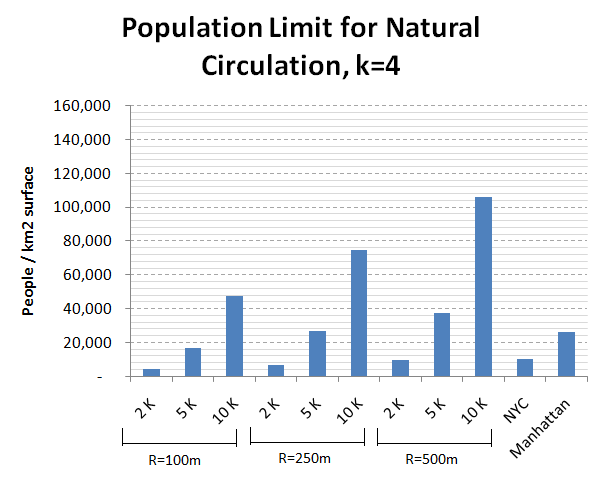 The population limit reported here is then divided by the livable area within a habitat. It is assumed (as in the reference design) that the length of the cylinder is equal to its diameter and no credit is taken for the are on the pinched ends. I put NYC and Manhattan on this as well for a reference. Note that in my reference design for the artificial gravity tube, density is still incredibly high - about that of Manhattan. 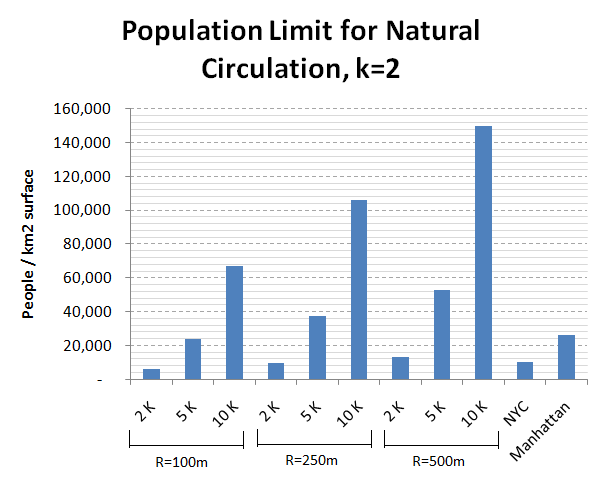 This applies for the scenario of Delta_T=5k, R=250m, and k=4, where the population constraint comes out to be about 20,000 people. To me, this still seems to be about the most reasonable reference design. I will elaborate on that a bit more in the conclusion. The design principle of the gravity balloon is more-or-less to locate industrial facilities that don't need gravity (or strong gravity) within the open air microgravity environment between colonies. It is crucial that we can show that critical services (like heat removal) can be viably provided outside the gravity tubes. For heat removal, not only can this be done, but it can be done at incredibly low cost using natural circulation. But that's not all we have to worry about. Possibly the most vital metric to control within a space habitat is carbon dioxide levels since this will cause negative health effects before lack of oxygen, however the limitation relative to the habitat's heat removal is less clear. Let's just look at the comparitative limits between these two. Consideration of the specifics of an artificial gravity tube isn't necessary. I'll just consider what temperature rise would also correspond to a dangerous rise in CO2 levels. None of these are particularly deadly. Humans can easily tolerate increases this much or greater. However, these were only formulated based on the assumpting that people were consuming 2 kW on average. That was supposed to be a conservative assumption, but in this case lower values might put us in a bit of a bind. If that was reduced to a value closer to the biological limit of around 200 W instead, then the above temperature changes would correspond to a dramatically higher CO2 concentration rise. As such, it's plausable to create scenarios where CO2 removal would be the overriding constraint on the allowable population of the tube... but this probably wouldn't be likely under normal conditions. My pessimism in the last post on this subject is lessened substantially. We can state a number of relatively attractive combinations of parameters which would be economically desirable and physical plausible. However, there is still a bit of a tight design envelope to fit. The heat production limit would likely constitute the gravity balloon's version of a "fire code". You could certainly pack more people into the tube, but the temperature would rise slowly. Except for some possibly extreme circumstances, it seems unlikely that CO2 removal would become more restrictive than heat removal. I find it hard to argue against natural circulation as a means of cooling the tubes themselves. The benefits compared to the alternatives seem immense. The air flow rates are unlikely to surpass the speeds which will be encountered near the windows anyway, and being a fairly localized thing, I don't expect the end seals to have a dramatic impact on the overall drag anyway. In fact, in some cases the air flow would be so low that in the center you couldn't rely on it to move out of the tube (starting at centerline) in a timely manner. For these cases, you would need a conventional transport system or elevator-like system. Since the heat production rate will vary throughout the day, this seems inevitable anyway.